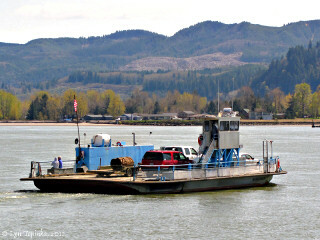 Click image to enlarge Westport to Puget Island Ferry "Wahkiakum" in route to Westport, Oregon. View from ferry terminal, Puget Island, Washington. Image taken April 22, 2011. The first ferry across the Columbia River began in September 1846 and went from John Switzler's land claim on Hayden Island, Oregon, over to the Hudson's Bay Company's trading post at Fort Vancouver, Washington. "CLACKAMAS COUNTY COURT.-- A special term of this Court was held last week, and some important business transacted. Mr. John Switzler was authorized to keep a public ferry on the Columbia river opposite Fort Vancouver." Source: "Oregon Spectator" (Oregon City), October 15, 1846, courtesy Historic Oregon Newspapers Archives, University of Oregon Libraries, 2016. Excerpts from: Colleen Bauman, "Clark County History - Crossing the Columbia River", 1988, Published by Fort Vancouver Historical Society of Clark County, retrieved via "Columbian.com" website, 2016. "Although mention has been made of supplies ferried in the 1840s from Fort Vancouver across the Columbia en route to the Willamette Valley – probably on the same crude log rafts that brought the settlers down from the Dalles and Cascades – no regular public ferry service was run by a white American until John Switzler Jr.’s in 1846. Switzer Jr., an 1845 immigrant from Virginia, settled on his land claim – present day Hayden Island – on the South Bank of the Columbia River opposite Fort Vancouver on the North Bank in September, 1846. His first crude row ferry, probably equipped with a sail, was to carry mainly foot traffic of Oregonians trading at the HBC post. This ferry was run sporadically by Mr. Switzler Sr. and his sons for nearly a decade." "Although ferries on the Columbia should have some under federal regulation, a general act “of the Regulation of Ferries”, passed Jan. 27, 1854, makes no mention of such a thing. In 1854, The Washington Territory passed an act regulating governance of such craft. Patterned after the Oregon law, the law would be changed little over the next several years. Despite provision for local regulation, the territorial legislature granted many charters establishing many rates of ferriage – granting eleven authorizations from 1854 to 1859 and nine from 1865 to 1869." "Indeed, as early as 1850, Mr. Forbes Barclay licensed himself with the government to run a ferry upriver a short way from Vancouver at what was called the upper landing at the Indian Village." "In 1851, on December 2nd, a license was “granted” to William Goodwin to establish a ferry from the head of Lady Island to above the mouth of the Washougal River. Other licenses granted in that period were to David C. Parker on June 10, 1854, for the same area; James Carty, on Lake River slough and O.W. Bozorth on the Cathlapoodle – present Lewis River – on March 7, 1855." "In 1855, with John Switzler Jr. taking over operation from his father, the Switzler ferry provided a more regular service for the next several years and was subject to some of the new licensing and regulations. For these fees, Switzler was required to pay $10 per annum. To continue the trip from Vancouver to Switzler Island it was necessary to take the Love ferry across the Columbia Slough – also referred to at that time by the paradoxical name of Love’s Slough – to Portland. At that same meeting rates were set for Lewis Love as follows: “For wagon and animal 25 cents; man on horseback 10 cents; foot passenger 5 cents; loose animals 5 cents.” He was required to pay a fee of $5 a year. $1.00 for a man and his team to be ferried across the Columbia and then an additional 25 cents to be ferried across the Slough seems a heavy fee for the times, but on July 3, 1855, Lewis Love made application for a new schedule of fees. “Foot passengers 12 cents; horse or mule 12 cents; man on horse 25 cents; wagon and one horse 37 cents; wagon with two horses 50 cents.” It was granted. Only July 31, 1855, John Switzler was allowed $250 for building a bridge along what was then known as the Columbia Bottoms. After the Switzlers quit ferrying, Wesley Van Schuyver ran a service to the Oregon shore, charging fees of : $1 per person; $3 for man on horseback; $2 for horse, mule or cow; $3 for horse and wagon; and $6 for a team and wagon. Hogs and sheep did not carry such a lofty charge at only 24 cents each. Even at these prices – finding the run unprofitable – he discontinued it in a few months, after which there was no regular service across the Columbia at Vancouver for sixteen years."